For all puppies between 8 and 16 weeks old. Need to know First Aid. • Puppy Preschool is where it all starts. You did it, didn’t you. You got yourself a puppy and it is reallllly cute and cuddly… Some of the time. But this cute puppy can be really naughty and misbehaves too. You have already been cleaning up “accidents” and have bought more carpet cleaner in the last week then you have needed in the last year. Your favourite shoes have been nibbled on and you are looking around for a new sofa. The teeth marks in the one you got are not looking very stylish. Are you feeling overwhelmed and out of your dept? These are all very common problem most people face with a new puppy and very common frustrations you are feeling now. Especially if this is your first time teaching a puppy. But don’t worry, we are here for you to help with all those puppy problems. If you live in South Australia either close to Seaford or Blackwood. 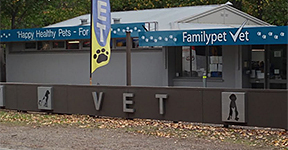 At Familypet Vet we can help you in our Coromandel Valley Veterinary Clinic or our new Vet Clinic in Mclaren Vale. At Familypet Vet we deal with new puppies every day. What is a very unique problem in your household, we have seen and heard it all before. We have been helping our clients with their puppies for over 20 years. 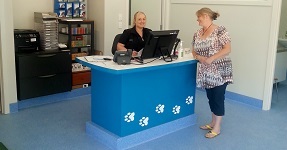 Michelle and Natasha run the puppy preschools every week in Familypet Vet Coromandel Valley Clinic close to Blackwood. Just give them a ring on 08 83703500 to find out when the next available puppy preschool starts. 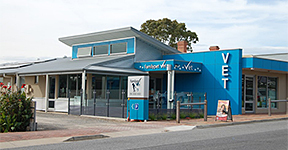 Lindsay and Dani will be able to help you in Familypet Vet in Mclaren Vale near Seaford with your puppy. These classes are for puppies between 8 and 16 weeks old puppies of any breed. They are held at both clinics at Mclaren Vale and Coromandel Valley at different times. It is a 1 hour class one evening a week that run for 4 weeks. We understand the problems can be very frustrating specially if you have got a busy life already and you don’t need any of these puppy issues. The good news is: with the right help from the qualified nurses at Familypet Vet) these problems will soon be fixed. All puppies have got the same build in learning process. Some are faster then others but they can all be taught. All we need to do is just show you and your family members how. Puppy preschool are run over 4 weeks. Each week our nurses with address different topic that you need to know about your puppy and that are relevant as your puppy gets older. Every week you will be training new commands and can talk to our nurses about any issues you might have at home. It is important that you bring the whole family. If that is not possible then make sure you bring the kids. The family needs to be all on board with training the puppy. So the puppy doesn’t get mixed messages and gets confused. Children love to come along and learn about teaching the puppy. It gives them a sense of responsibility and involvement. It is a commitment from you and your family for one night a week for 4 weeks to make the rest of your life with your new dog an enjoyable experience for life. • Why do you need puppy preschool? 62% of dogs that are euthanized at the RSCPA in Australia is due to behavioural issues. Most of these could have been avoided if they would have been taken to puppy preschool and Dog Training classes. No puppy is deliberately trying to make your life a misery. They just don’t understand what it is you would like them to do. Puppy preschool is your way to learn how to communicate with your new puppy so the puppy knows what it is you would like it to do. The key to training your puppy is positive reinforcement. 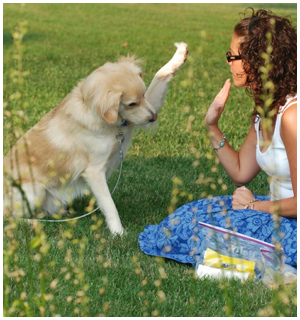 This is the Delta dog training principle that our nurses all believe in and have seen great results with. Training a dog is easy. Encourage the behaviour you like and ignore the behaviour you don’t want. Dogs are that straight forward no hidden agenda’s or manipulating intended. They all come with an internal drive that is different for each breed. The trick is to work with those trades. You chose your puppy for a reason. If you chose a Labrador you must know that this is a retriever breed and will love to play with a ball and retrieve it. If you chose a German shepherd your dog is a guard dog and will be protective. If you have got a Border Collie this dog will round up kids or other small things in the absence of sheep. Telling them of for doing what comes naturally will confuse your puppy. 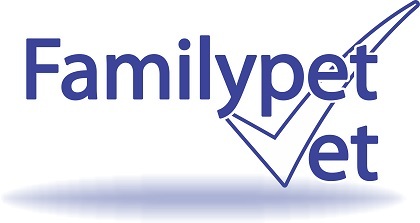 Working within the bounds of your dog’s ability is what we do best at familypet vet. It is a fun learning process with other people that are in the same boat as you. Make an appointment for your FREE new pet check Now. 6. Insurance policy number if you got one. Tip: To get the best use out of your time in the clinic. Make sure you book an appointment with one of our experienced nurses first to ask them all the questions you have got now.